At Grandville Avenue Arts and Humanities the volunteers are critical and cherished supporters in pursuing our mission. Here at Grandville Avenue Arts & Humanities (GAAH), the volunteers are critical and cherished supporters in pursuing our mission. The students always rush to the door to greet the volunteers with literal open arms and spend every minute possible with them. For many of the students, simply spending time with “big kids” they can look up to is a comfort and a friendship they treasure. 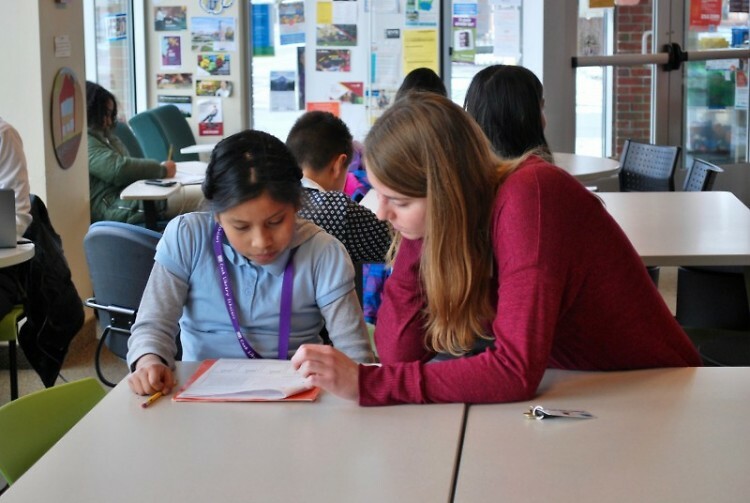 Anna Oakes, a sophomore at Calvin College, is a consistent volunteer at the Cook Library Center. She is from Princeton, Minnesota and is studying Speech Pathology. Her experience is one that embodies the spirit of volunteering: giving back has in turn given her joy. In the following interview, Anna shares her thoughts and takeaways in being a volunteer at the Cook Library. GAAH: How did you initially hear about the Cook Library Center/GAAH? Anna: I heard about Cook Library Center because each of the dorms on Calvin’s campus is paired with a local organization, and my dorm was partnered with Cook Library. The Community Partnership Coordinator in my dorm told me about what Cook Library does and encouraged me to volunteer. GAAH: When did you first get involved with the Cook Library Center? Anna: I started volunteering at Cook Library last year. GAAH: Why did you pursue this volunteer opportunity? Anna: I initially started volunteering because it was convenient and because it involved working with kids. However, I continued to pursue it because the volunteering goes towards a really good cause, I continue to learn new things along the way, and it’s a really fun and rewarding experience. GAAH: Do you remember your first day as a volunteer or your first impression of the library? Anna: The main thing that I remember about my first day as a volunteer was how welcoming the Cook Library kids were and how thankful they were to have you help them with their homework. I also remember how happy they were to have someone to just sit and talk with them. The time went by faster than I expected because it was so much fun. GAAH: What keeps you coming back as a volunteer? Anna: What keeps me coming back as a volunteer is definitely the Cook Library students. Their smiles and energy are so contagious and it seems like you always leave feeling happier than you were when you came. It feels good to know that you are there helping the students with something as important as education. To me, it seems like you start volunteering thinking that you are there to help them learn, when really there is so much that you can learn from them. GAAH: Has anything surprised you about volunteering here, our mission, or how our work plays a role within society in general? Anna: One thing that really surprised me was how close-knit the community and kids all seem to be in the Roosevelt Park Neighborhood. It was amazing to see how Cook Library is part of a community that really seems to care for each other and for the future of their students. Volunteering there makes you feel like you are part of something much bigger than yourself. GAAH: What has been the most challenging aspect of being a volunteer here? Anna: One of the most challenging aspects of being a volunteer has been knowing that volunteering at Cook Library is such a fun and rewarding experience, yet you still see a lot of people who choose not to volunteer because they seem afraid to try something new or claim that they are too busy to volunteer. GAAH: What is your favorite memory while volunteering at the Cook Library Center? Anna: My favorite memory so far was when one of the students told me that she was so thankful that I always help her, and she gave me a hug and called me her best friend. It totally made my day. GAAH: Have your formed a close bond with any students? If so, please share! Anna: I kind of tend to rotate what students I work with, but I started working more with Melissa for a while, and she was the one who called me her one of her best friends. GAAH: If someone you knew was considering becoming a volunteer with GAAH, what would tell them? Anna: I would definitely tell them to become a volunteer because it is a truly unique and amazing experience. Volunteering does not feel like something that you have to do or something that you should do; it is more like something that you want to do because it feels so rewarding. GAAH: Is there anything you wish people knew about GAAH? Anna: I just wish that more people knew about it and how amazing and beneficial it is. GAAH: What are three words you would use to describe your overall experience as a volunteer at the Cook Library Center? Anna: Diverse, enlightening and rewarding! Calvin College’s Community Partnership Program, the program through which Anna was introduced to GAAH, was recently recognized on a national level. Sue Garza, director of the Cook Library, is heavily involved in orchestrating and maintaining the college’s involvement with our organization. We deeply value this partnership and the committed volunteers like Anna we’ve met through Calvin College. To read more about this honor, click here!